I had the bamboo rug for several years now and color faded a lot. My sunroom acutally facing north doesn't get much of sun. Overall it's a decent product. Dimensions 6 ft. x 9 ft. The print leaves on the carpet are not as vivid as the picture. I wish I had gotten a bigger one because it's nice. It's comfortable to walk on and I hope it stands up to the weather. Beautiful mat. My elderly dog took to urinating on it, and it survived two full urinations and two full cleanings with questionable cleaning products before I was forced to hang it on the wall- still in perfect shape. Good value! Stitching has held well and the bamboo is not swelling from the humidity in my house (we do not have central air and have 90+ degree humid summers). Stood being rolled on and stomped on by 3 dogs for the short time it was on the floor. The backing and boards themselves seem hard to damage- very good! This was exactly what I was looking for. The colors are more muted than what is pictured and that's exactly what I wanted. This rug blends beautifully with my vibrant colored cushions in the same pattern. It is on my deck and has weathered several Colorado storms and intense sunlight but still looks brand new. Plus, we love how it feels in our bare feet. Great value! Anyone who has seen this rug in my house has inquired about where i got it and how different and gorgeous it is...men included! I love palms and this fits the decor of my lanai, it sits beneath my 7 piece patio set and feels very nice underfoot and gives you a relaxed tropical feeling. It's gotten a little dirty on the area where my dog walks in from the backyard and hoping that it won't be too difficult to keep clean with gentle wiping and hoping it withstands the humidity. I put the rug indoor in the kitchen under my tile floors. The bamboo eventually split. In fairness, my tile floors are not level so make sure to check if there are other reviews stating this problem. A pretty rug but not good if you have a lot of foot traffic over it. The pieces tend to come out of the boarder. Had to get rid of it after a few years. It is more decorative than useful. Had a few black dots but looks good. nice product, love the pattern. It fit perfectly into the room, the colors and design were what I needed to tie the room together. I needed something that could work with a retro theme as well as a contemporary theme. This fit the bill just great. I was looking for a natural fiber rug to replace a ten-year-old jute rug on our unheated front porch. I hadn't seen anything I like with a print until I happened on this rug. It's bamboo, about which I am skeptical, but I like how it looks in the photo and the reviews were good so I am giving it a try! 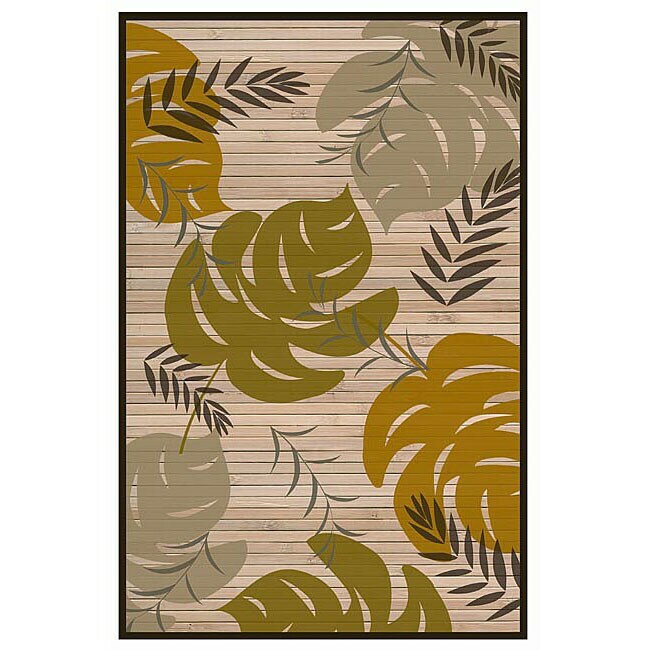 Nourison Paramount Multicolor Rug - 5'3" x 7'3"
Nourison Paramount Beige Area Rug - 5'3" x 7'3"